Natural stone is a strong, eco-friendly, durable, low-maintenance, versatile décor option, which helps add pattern, texture, and personality to any space. 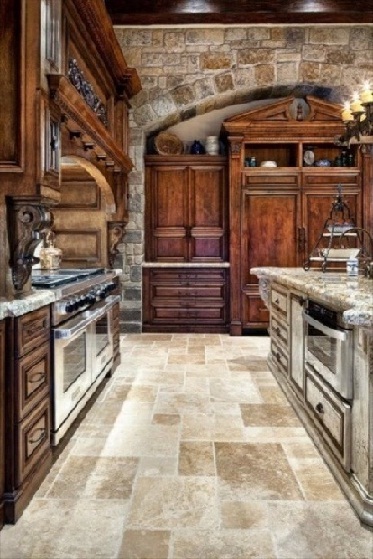 From marble to travertine to granite and sandstone to quartz and limestone, when used right, stone design solutions work well and lend a timeless look. Whether as accent walls, flooring, staircases, fireplaces, countertops and backsplashes, a plethora of ways helps incorporate this stunning material. Use lighting to accentuate and enhance the beauty of the stone, whatever type it is. Usually, warm colors/reds, yellows, and oranges/ and accessories, such as furs, throws, throw pillows, and area rugs that create a sense of coziness soften the look of the stone décor elements. Just as in nature, combine stone with plants, water, and fire to achieve impressive, bold designs. For a truly unique look, use stones in contrasting hues and varying shapes and sizes. However, always consider the size of the space, otherwise, in small spaces, a large stone feature can look overwhelming. Stone offers beauty, amazing textures, and simple maintenance. Available in an array of colors and in a wide spectrum of budget options, with their natural charm, different stones can complement almost any design style, décor, and setting. In addition, when paired with wood introduced as cabinetry, flooring, and/or furniture, stone helps create truly mind-blowing spaces. In the wood-stone combo, lighter woods usually balance the look of darker stones. Inherent to interiors with a rustic or country vibe, stone walls look simply awesome and add dimension and a sense of unbeatable lure. 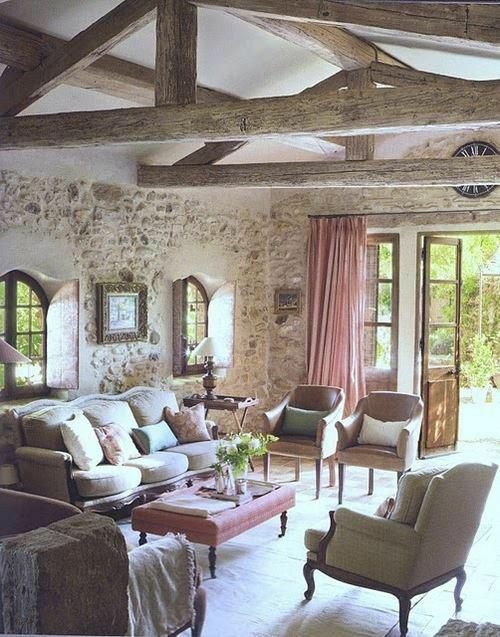 In the picture above, a Provence-style living room, which enchants with its effortless elegance. Solid stone walls, wood trusses, uniquely shaped windows… Delicate touches of pink add a distinctive feminine vibe. Definitely a refined, wow-worthy room! Extensively using exposed stone, brick, and wood, rich earthy colors, plenty of textures, and wrought iron décor pieces, Mediterranean-style spaces are cozy, inviting, and dramatic and offer timeless beauty and magic. Stone walls work perfectly well in Mediterranean kitchens, traditional or with a contemporary twist, and help create truly magnificent spaces. Above, an awesome Mediterranean-inspired kitchen. Stone walls serve as an exquisite backdrop. 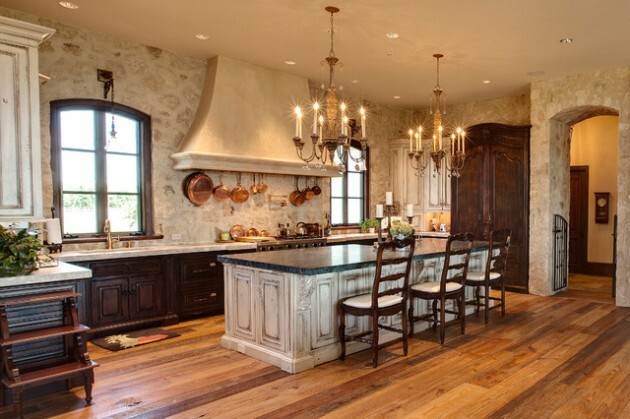 Gorgeous wood flooring and cabinetry, a stunning hood, and an ornate island add to the appeal of the space. Matching chandeliers dropped over the island bring extra visual interest. This kitchen definitely exudes warmth, coziness, and calmness and has tons of charm and personality. As already mentioned, stone walls work well in any design style, from rustic and traditional to contemporary. They add simplicity, unassuming organic charm, interest, and touches of drama and exotics and break the monotony of modern homes. Shown above, stone walls are the background of this admirable traditionally styled attic bedroom in neutral colors, which offers different textures and subtle patterns. A skylight and an area rug add natural light, color, and visual interest to this space full of character and charm. 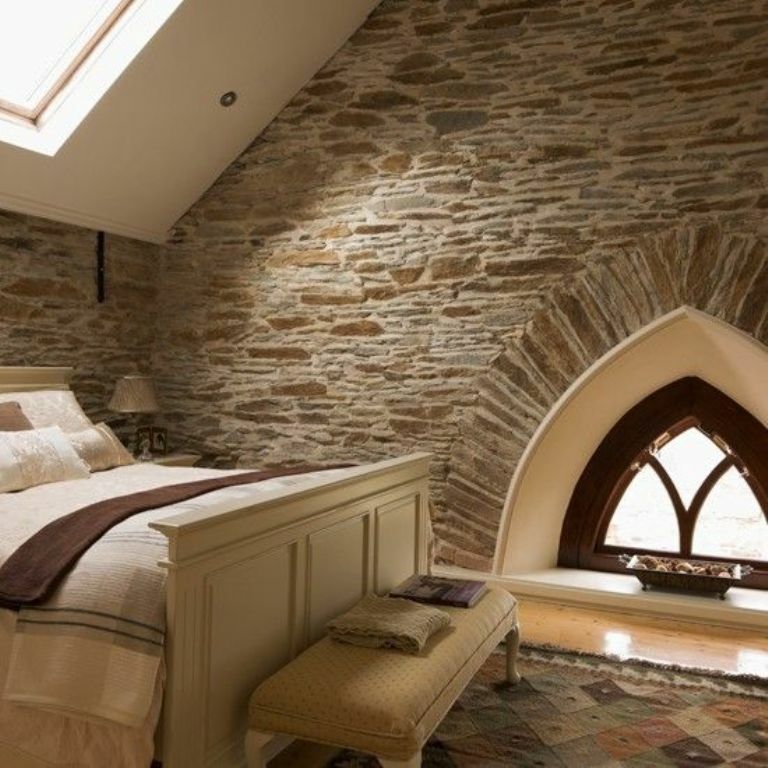 What actually takes center stage is the unique arched window surrounded by eye-grabbing stonework and architectural detailing. Simply enchanting! However, if not ready to drastically change your interior, opt for an accent stone wall to add some extra elegance, rustic touches, and personality. 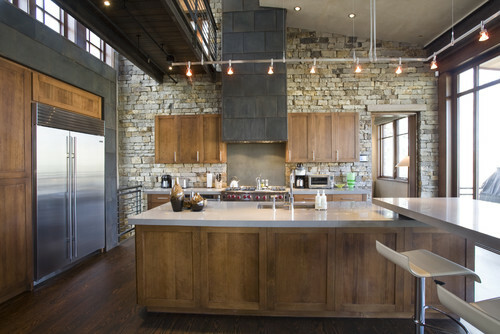 In the picture above, a clean-lined contemporary kitchen with Industrial-style touches. An accent stone wall adds rustic beauty, visual interest, texture, and personality to this bathed in natural light space. Incorporating stone as countertops and backsplashes is a favorite décor option. Quartz, granite, marble, soapstone, and travertine, each with its pros and cons, are popular choices that make appealing, long-lasting countertops. Whatever the stone, it offers a way to add an organic flair and create a statement décor element. Above, a covet-worthy kitchen, in which function meets charm. Marble countertops complemented by an accent stone wall add personality to this Industrial-style kitchen. A wood ceiling and exposed beams make the space warm and inviting. A clever lighting scheme highlights the beauty of the natural materials. Flooring is another option to incorporate pieces of beautiful natural stones. Cut to tile size, stone flooring is a timeless choice, which immediately adds character, dimension, and touches of class, elegance and luxury to any space. Available is a range of colors, natural stones definitely make a unique, long-lasting flooring material, which fits in with any décor style and works well in any space. Different finishes are used to lend the space a customized look. Generally, for a rustic look, choose a tumbled or antique finish. A glossy finish gives a smooth, modern look. If tough on budget, you can use natural stone flooring either in smaller spaces or as borders or insets to another material. Even when used on a small scale, natural stone flooring lends a striking, upscale look. Travertine, marble, and limestone are some of today’s most commonly used options. When it comes to natural stone flooring, always consider adding plinth lighting, it offers a way to both accentuate the beauty of the stone and add extra visual interest to the space. In the picture above, a bathroom with a timeless look. Marble flooring and half walls add texture and touches of elegance and luxury. 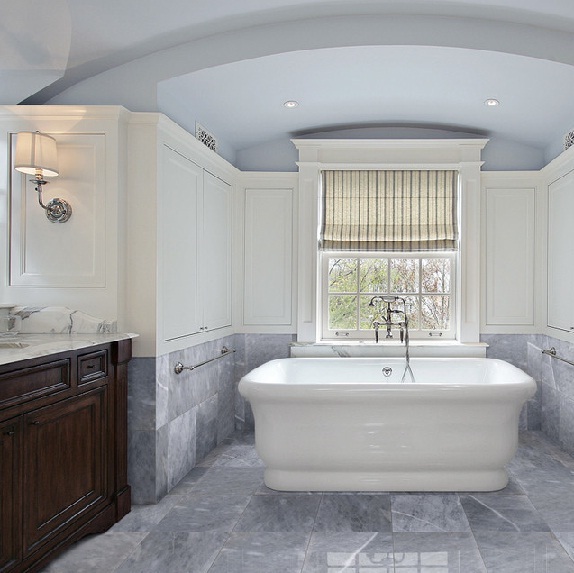 A white freestanding tub grabs and keeps attention. A Roman shade offers color and privacy. Definitely a classy space! 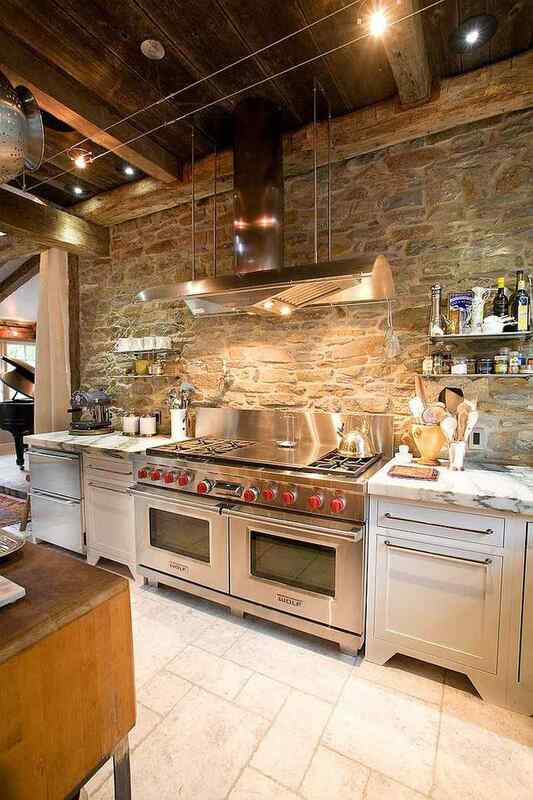 Above, a jaw-dropping kitchen with extensive use of natural stone and wood. Stone flooring and walls complemented by granite countertops and wood cabinetry definitely create a unique space. Stainless steel appliances add touches of modernity. Although fireplaces lost their role as a key source of heat long ago, when it comes to creating a homey atmosphere and adding texture, warmth, coziness, and touches of magic, stone fireplaces are still an unbeatable option. Wherever positioned, they immediately turn into a focal point. Whether with a classic or contemporary look, stone fireplaces fit in with any setting, from rustic to modern and help create gathering zones for relaxation or entertainment. In the picture above, a living room, which exudes warmth and calmness. 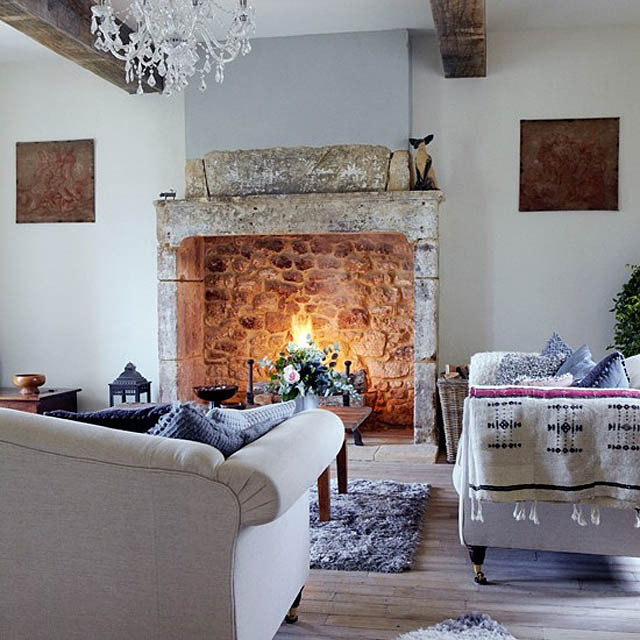 A covet-worthy stone fireplace definitely makes a statement. Exposed wood beams, pieces of wall art flanking the fireplace, hand-woven fabrics, and a woven log basket add to the distinctive rustic vibe of this intriguing space. Flowers bring color and freshness. A graceful crystal chandelier creates a sense of unexpectedness and adds sophistication. Truly impressive! As they add a sense of Old-world elegance, luxury, and sophistication, stone staircases make a stunning addition to any home. From straight to subtly curved to spiral, ornate or not, with or without balustrades, staircases are definitely a statement décor element. When space allows, consider a double staircase, it is a truly imposing option. Marble and granite are widely used staircase options. Note that when it comes to staircases, stone combines perfectly well with glass, wood, or stainless steel. Above shown, a magnificent entry with a distinctive architectural character. 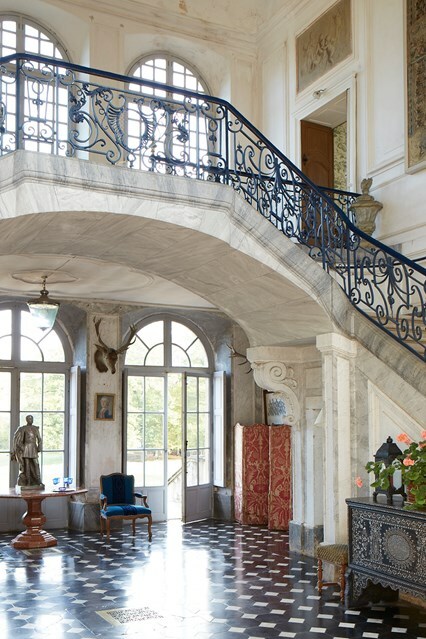 An imposing stone staircase with an ornate wrought iron balustrade definitely takes the center stage. Natural stone is extensively used in exterior spaces. From exterior walls to staircases to fireplaces to garden art, patio covering, and landscaping to water features, benches, trims, retaining walls, and more, there is a plethora of options to incorporate stone because it is a way to add to the curb appeal of any property. 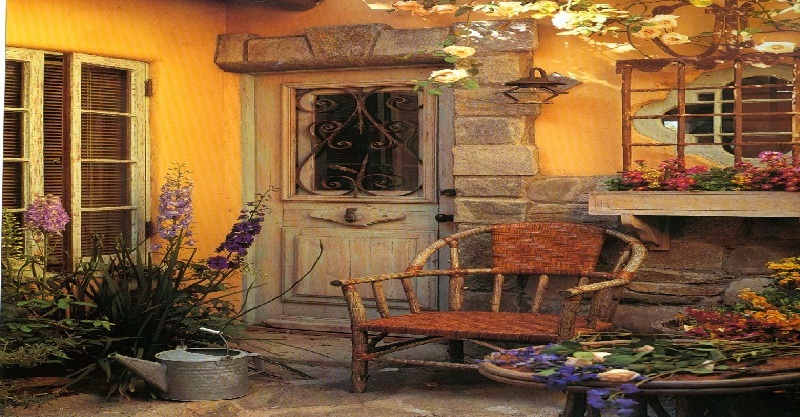 Note that when used for exterior walls, stone works well with stucco, brick, and wood. Natural stone is an appealing, durable, eco-friendly, versatile, and strong material. It exudes warmth, simplicity, and stability and helps lend any space a unique look.